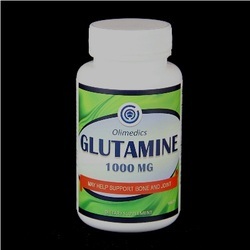 Glutamine is a natural amino acid that is critical during times of physical stress. Intense workouts may deplete levels of glutamine faster than the body is able to produce it resulting potentially in the breakdown of muscle tissue. The additional intake of glutamine helps prevent loss of muscle tissue during rigorous training due to the anti-catabolic properties of this amazing amino. Glutamine is also recognized for its possible benefits in stimulating the release of growth hormone by the pituitary gland. For best results, take with juice, milk or protein shakes. Other ingredients: Dicalcium phosphate, povidone, vegetable stearic acid, croscarmellose sodium, vegetable magnesium stearate, silicon dioxide and pharmaceutical glaze.